A weekend of stand up comedy set in the picturesque and enchanting town of Machynlleth over the first May bank holiday weekend. Book a bell tent or yurt and have your tented accommodation ready and awaiting your arrival. Entering its seventh year, it is a real cauldron of creativity producing an unforgettable experience for both visitors and performers alike. Bring your hot water bottle! 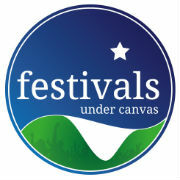 To book: email us at bookings@festivalsundercanvas.co.uk with your preferred tent option, as well as any extras that you may require. We will send you an invoice, payable by BACS to secure your booking. Please also include a contact telephone number as well as any special requirements that you may have. Please use the subject line 'Mach Comedy 19' when getting in touch. Book a yurt and benefit from a split payment system - pay 55% to secure the yurt booking now and a 45% balance payment due 45 days before the start of the event. Guests have 14 days from the date of booking to cancel their booking. Please note: this only applies to cancellations requested more than 45 days before the start of the event. After 14 days, bookings are non-refundable. Bookings made within 45 days of the start of the event are non-refundable. Guests are recommended to take out separate cancellation insurance in the event that they need to cancel in unforeseen circumstances. If you need to cancel within 45 days of the event, we can, at our discretion, try to rebook your tent, in which case we can give a refund minus a £50 admin fee. Balance payments are required to be settled 30 days before the start of the event.